Hundreds or thousands of cyborg crickets could form a mobile communications network, transmitting signals through their calls. Credit: Wikimedia Commons. (PhysOrg.com) -- By taking advantage of the way crickets communicate, researchers are building "cyborg crickets" that could form a mobile communications network for emergency situations, such as detecting chemical attacks on the battlefield, locating disaster victims, monitoring gas leaks, and acting as smoke detectors. This kind of living, mobile communication network would include groups of not only crickets, but also cicadas and katydids. Like their natural counterparts, the cyborgs would communicate through wing beats. Containing a package of electronics and sensors, the insects would change their call tone in the presence of various chemical and biological agents on the battlefield, or even the scent of humans trapped in rubble after natural disasters. The technology's designer, Ben Epstein, came up with the idea during a visit to China, where he heard cicadas changing calls in response to each other. Recently, the Pentagon has awarded Epstein's Point Pleasant Beach, New Jersey-based company, OpCoast, a six-month contract to develop a mobile communications network for insects. The biggest challenge will be to fit all the necessary electronics into a tiny body, and then make hundreds or thousands of them in each network. 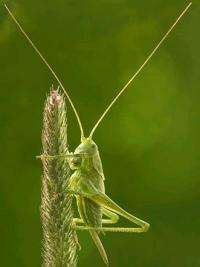 The network could potentially extend across large distances, as some katydids can be heard up to a kilometer away. As the cyborg insects transmit the call from neighbor to neighbor, the cascade effect eventually transmits the signal to ground-based transceivers, where humans can respond. Is this seriously what our nations leaders are spending money on in these times? We are boned. "The biggest challenge will be to fit all the necessary electronics into a tiny body, and then make hundreds or thousands of them in each network." It is nice to see such an astute summation of the technological challenges of making a network of cyborg crickets. We've done exactly this with sharks, and with pigs, last year it was beetles. Its perfectly doable, if not exactly morally sound. Yes vika, this is evil. Or, for those not philosophically inclined, scientifically unsound. Changing an animal's natural function so that it works into a human system completely changes the role of that animal in nature. If it were done for an entire species, it would have to be called deliberate extermination. Extinction. Intentional extinction. People do not have a right to do this. Or if you will, it would be unwise to change a worldwide system without appreciating the consequences.